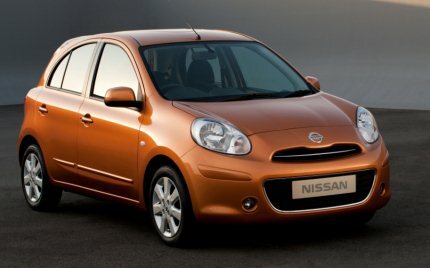 Nissan has commenced the full production of its much awaited small car Micra at its Oragadam plant in Chennai. 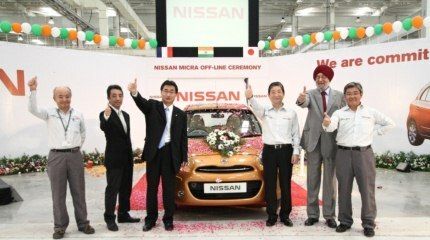 These “Made In India” Micras rolled out of the assembly lines at the hands of Mr. Toshiyuki Shiga, Chief Operating Officer, Nissan Motor Company. Present on this momentous occasion were Mr. Akira Sakurai, Managing Director & CEO, Renault Nissan Automotive India Pvt. Ltd., Mr. Kiminobu Tokuyama, Managing Director & CEO, Nissan Motor India Pvt. Ltd. and the 1900 employees of Nissan-Renault operation. Mr Toshiyuki Shiga CEO Nissan Motor Co said that this is the start of the commercial production of the Nissan Micra and a new beginning for the company in India. The Micra is specifically made keeping in mind the needs of Indian buyers. The Indian-produced Micra would also be exported to Europe, Middle East and to Africa later starting September this year. The Nissan Micra cars would be hitting the Nissan showrooms across the country starting the 25th of May and prospective buyers can pre-book the Micra as well from the same day. A booking fee of Rs.50,000 would be needed for the same. Micra would hit Indian roads from July this year. It may be recalled that Nissan-Renault jointly invested 45 billion Rupees in getting the new manufacturing unit spread out across 640acres at Chennai and Micra would be the first car to be produced using this facility. With an production capacity of 200,000 units Nissan is seriously eyeing the Indian market with the Micra and also wants India to be its global export hub. With a bunch of hatchback cars launched in India Indian in the last six months, and mostly all of them selling well, the Nissan Micra sure has its work chalked out. The Micra would compete in the price-sensitive small car segment against the likes of the segment leader Maruti who has the New Wagon R, Swift, Alto and the Ritz. Chevy has the best seller Beat while Hyundai has the no-frills version of the i20 and the i10. Fiat has the 1.2 Punto which it recently launched while Tata Indica Vista competes from Tata Motors. Pricing of the Nissan Micra would hold the key and we are sure Nissan would be working hard to get the price right from day one. – Safety features – Antilock braking system, Engine immobilizer, Driver and front passenger SRS airbags.